Android provides a default Bluetooth stack that supports both Classic Bluetooth and Bluetooth Low Energy. Using Bluetooth, Android devices can create personal area networks to send and receive data with nearby Bluetooth devices. In Android 4.3 and later, the Android Bluetooth stack provides the ability to implement Bluetooth Low Energy (BLE). To fully leverage the BLE APIs, follow the Android Bluetooth HCI Requirements. Android devices with a qualified chipset can implement either Classic Bluetooth or both Classic Bluetooth and BLE. BLE is not backwards compatible with older Bluetooth chipsets. In Android 8.0, the native Bluetooth stack is fully qualified for Bluetooth 5. To use available Bluetooth 5 features, the device needs to have a Bluetooth 5 qualified chipset. Note: The largest change in the native Bluetooth stack between Android 8.0 and previous versions is the use of Treble. Vendor implementations in Android 8.0 must use HIDL instead of libbt-vendor. At the application framework level is application code, which uses the android.bluetooth APIs to interact with the Bluetooth hardware. Internally, this code calls the Bluetooth process through the Binder IPC mechanism. 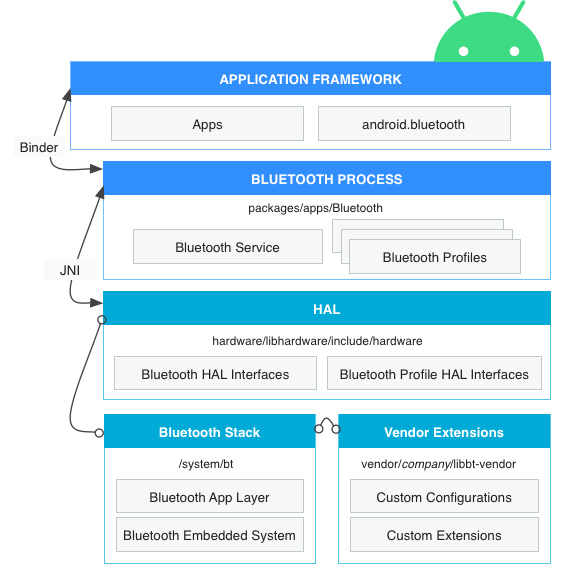 The Bluetooth system service, located in packages/apps/Bluetooth, is packaged as an Android app and implements the Bluetooth services and profiles at the Android framework layer. This app calls into the native Bluetooth stack via JNI. The JNI code associated with android.bluetooth is located in packages/apps/Bluetooth/jni. The JNI code calls into the Bluetooth stack when certain Bluetooth operations occur, such as when devices are discovered. The default Bluetooth stack is provided in AOSP and is located in system/bt. The stack implements the generic Bluetooth HAL and customizes it with extensions and configuration changes. Vendor devices interact with the Bluetooth stack using the Hardware Interface Design Language (HIDL). 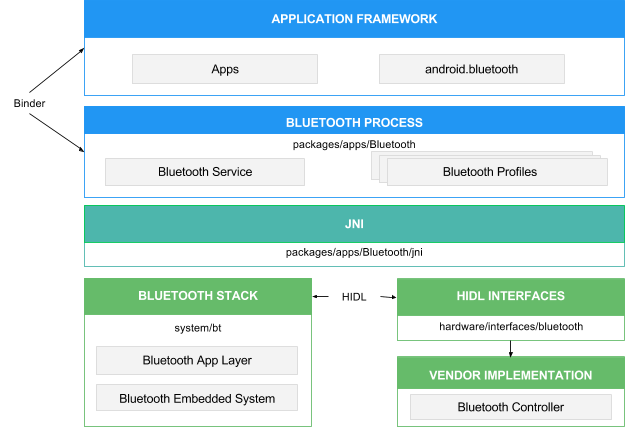 HIDL defines the interface between the Bluetooth stack and the vendor implementation. To generate the Bluetooth HIDL files, pass the Bluetooth interface files into the HIDL generation tool. The interface files are located in hardware/interfaces/bluetooth. The Android 8.0 Bluetooth stack is a fully qualified Bluetooth stack. The qualification listing is on the Bluetooth SIG website under QDID 97584. The core Bluetooth stack resides in system/bt. Development happens in AOSP, and contributions are welcome. At the application framework level is application code, which utilizes the android.bluetooth APIs to interact with the Bluetooth hardware. Internally, this code calls the Bluetooth process through the Binder IPC mechanism. The Bluetooth system service, located in packages/apps/Bluetooth, is packaged as an Android app and implements the Bluetooth service and profiles at the Android framework layer. This app calls into the HAL layer via JNI. The JNI code associated with android.bluetooth is located in packages/apps/Bluetooth/jni. The JNI code calls into the HAL layer and receives callbacks from the HAL when certain Bluetooth operations occur, such as when devices are discovered. The hardware abstraction layer defines the standard interface that the android.bluetooth APIs and Bluetooth process call into and that you must implement to have your Bluetooth hardware function correctly. The header file for the Bluetooth HAL is hardware/libhardware/include/hardware/bluetooth.h. Additionally, review all of the hardware/libhardware/include/hardware/bt_*.h files. The default Bluetooth stack is provided for you and is located in system/bt. The stack implements the generic Bluetooth HAL and customizes it with extensions and configuration changes. To add custom extensions and an HCI layer for tracing, you can create a libbt-vendor module and specify these components. The Bluetooth HAL is located in /hardware/libhardware/include/hardware/bluetooth.h. The bluetooth.h file contains the basic interface for the Bluetooth stack, and you must implement its functions. Profile-specific files are located in the same directory. For details, see the HAL File Reference.